A screenshot of the whale caught on camera. Video: Justin Pope. A humpback whale and its calf has been caught on camera swimming just off the coast of Tauranga. 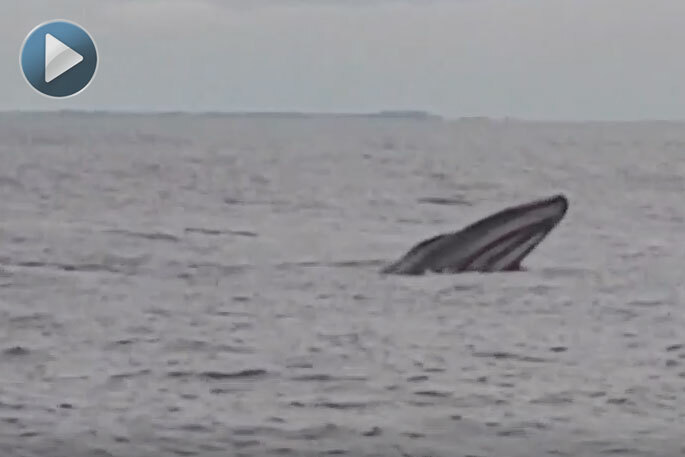 A video sent to SunLive by Justin Pope shows a humpback whale and its calf out at Karewa Island around 6pm yesterday. Justin says the footage is of a killer whale attacking a humpback whale and its calf. Humpback whales are easy to identify and are well known for their spectacular breaching and beautiful, complex songs, according to the Department of Conservation. Their tail flukes are broad and have a unique black and white colour pattern, which allow individuals to be identified. They have a variable colour but are generally black with white on the underside and on the flippers.